Skagway, if you’ve never been there, sits in a narrow valley extending off Taiya Inlet—the northern end of Lynn Canal (a fjord, not a man made canal). 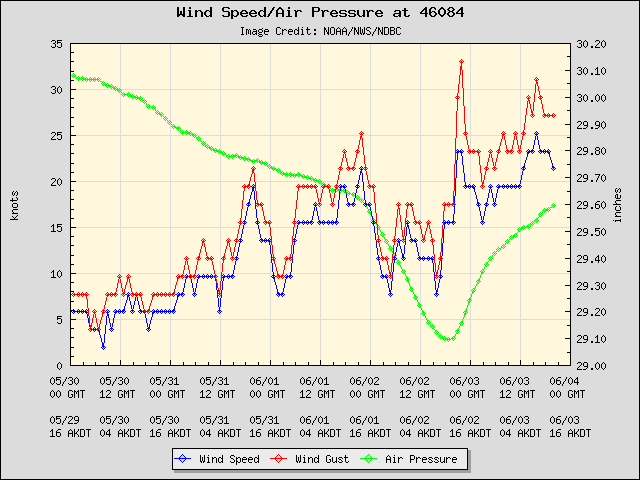 The wind sweeps through the town proper with pretty much the same strength as it does at the closely adjacent airport (where the weather station is). So we can say the airport ASOS (automated wx station) is quite representative of the town, something that cannot be said for many cities. This day, Skagwegians and thousands of visitors off the 4 large cruise ships in port were no doubt enjoying the 77F (25C) warmth and light winds at 1pm. Yes, the north winds had been blowing–up till a couple hours earlier–around 15 mph (7 m/s), which, incidentally, is why the temperature had risen so quickly. 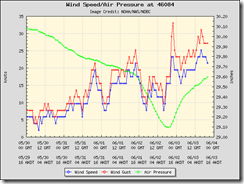 As you can see on the surface chart below (valid at 4 pm, close to the time of the Skagway blast), there is a front cutting across SE AK (click on it for larger version). The front is moving north, and on the previous map (6 hrs earlier), it was drawn at Dixon Entrance (not yet in AK). Sure, fronts cause wind shifts and temperature changes, but looking at this chart and thinking June it is not obvious what was going on in upper Lynn Canal. Three things seem to not jive with the ground truth at Skagway. (That’s the fun of weather.) 1: The front is drawn as a occluded front, meaning the warmest air has been pushed aloft, and such fronts often have a subdued effect on the surface. 2: The front is drawn with a broken line, which indicates the analyst decided it was beginning to dissipate. 3. 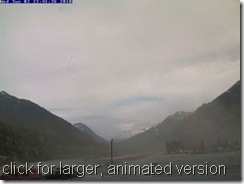 The front is drawn as barely past Sitka, about 100 miles (160 km) south of Skagway. Remember, fronts are boundaries between air masses of differing densities (to keep it simple). Higher density air is going to tend to displace lower density air, push it back or up or both. This is pretty intuitive. Lower density air is air which is warmer, more humid, or under lower pressure, or some mix of the three. What happens when an air mass is moving and displacing less dense air ahead of it, and the air ahead of it is getting less and less dense? Just like an army who has broken through the heavily guarded battle front and finds little resistance behind it, it will accelerate. The warming of the land in the northern Panhandle and onshore into Canada created a region of low density air (for you pilot types the density altitude prior to the front was around 2200 ft (>600 m)). I’d love to hear your thoughts (or direct experiences) on this situation, or at least what you thought of the write-up. The Start of the Alaska Aurora Season? My friends and I were on our 10ft folding boat out at the back of Chilkoot lake when this front hit the area. It was quite a surprise to us. We were enjoying a nice clear calm day on the water when we started to notice some darker clouds to the south. Knowing that some weather should be making its way in that afternoon or evening, I decided we better start heading back towards the boat launch. 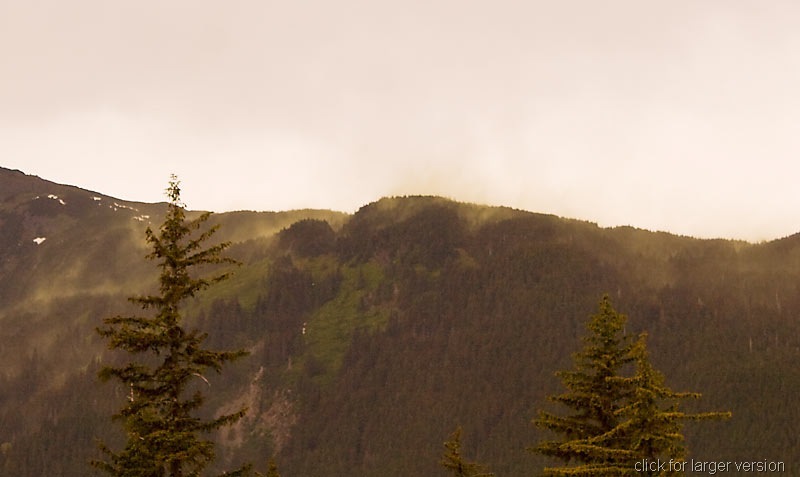 Soon as we started back we saw mysterious-looking greenish plumes blowing over the treetops towards the lake (quite an ominous sight!). That must have been blowing dust or pollen moving in (maybe even sea spray?). Then we got to watch the gust front move towards us across the lake, making pretty good waves. We knew this was going to be interesting. Suddenly it hit us. Before we knew it we were catching air over 3-4 ft waves, and only barely making progress as we tried to power into a ~30 mph headwind with my 2.5hp outboard motor! We only barely made it back without have to take refuge somewhere onshore. There was a canoe back there as well, I wonder how well they made out. No photos, we were too busy putting our gear away to keep it dry. Anyway, it was a sight that I will remember for some time.